This is a well cared for neighborhood home on an acre lot. The living room is open and inviting, tastefully decorated and with gleaming hardwood flooring. 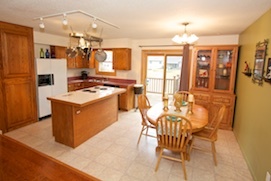 The kitchen is open to the living room and features a tile top center island with seating! The kitchen has a dining nook, perfect for entertaining. Sliding glass doors allow access to a multilevel deck. With a total of four bedrooms, (this home has three bedrooms but could easily be converted back to four) the possibilities are endless. If you need a home office, den, craft room, or guest room this house can have it all! It includes a master suite with a half bath along with a main bath with full tub and shower. This home is in move-in condition, comes with a 13 month Home Warranty America warranty,and ready for showings so make an appointment now. 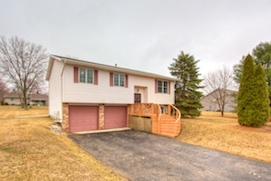 This is a great value, and wonderful piece of Ann Arbor area real estate!